When you are at a loss as to what to cook for dinner, always choose stir fry. Not only does a stir-fried meal come together in under 30 minutes but it is a great way to use up odds and ends in the fridge. Spicy peanut chicken and vegetable stir fry is a family favorite. It is a hybrid between Thai chicken satay and Chinese kung pao chicken. An assortment of vegetables and chicken are simmered in a creamy homemade peanut butter sauce. For those with a peanut allergy, feel free to substitute with almond butter or cashew butter. Step 1: Cook rice according to package directions. Season lightly with salt. Step 2: In a food processor or blender, combine the ginger, garlic, peanut butter, soy sauce, lime juice and zest, sugar, red pepper flakes and chicken broth. Blend until smooth and all ingredients have combined. 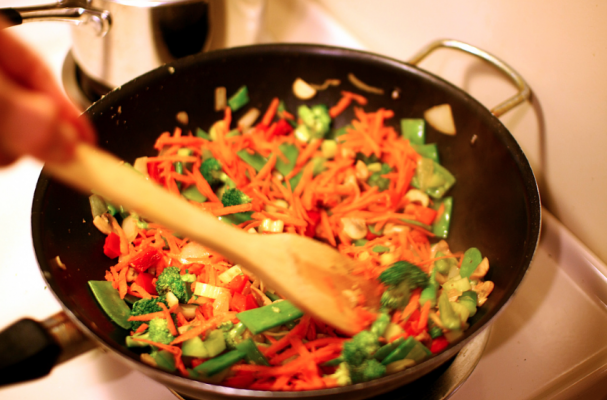 Step 3: Heat the vegetable oil in a non-stick saute pan or wok over medium high heat. Season the chicken lightly with salt and pepper. Add the chicken to the hot pan and saute for 3 to 4 minutes until just beginning to brown. Add the vegetables and continue to cook for another 5 to 7 minutes or until vegetables are softened and vegetables have cooked through. Step 4: Add the peanut butter sauce to the pan and stir until well incorporated. Simmer the chicken and vegetables in the sauce for 3 to 4 minutes. Remove from heat and stir in the cilantro and peanuts. Serve over the steamed white rice.